The establishment of Northeast was the result of a meeting of the Northeast Improvement Association on May 25, 1911. A committee which consisted of R.A. Long, Colonel F.W. Fleming, E.C. Meservey and John E. McFee conferred with the school board about the proposed school. On November 2, 1911, the board of education bought from the Abington Land Company, a block of ground for the proposed Northeast High School. The ground had a frontage of 600 feet north & south and 249 feet east & west. Thirty thousand dollars was the price paid for the plot which was located in a park and boulevard system. Soon after this purchase, a committee was sent East to study high schools. Regarding the course of study, Mr. I. I. Cammack, superintendent of schools said the following: "Teaching will be on the academic plan, proposing to give the highest and broadest development to the pupil as an individual, enabling him to discover for himself his own powers, tastes and capabilities, thereby helping him the better to select the calling for which he is best suited." In the spring of 1912, about one year from the time the movement was first started, the actual work began on the building. A movement was started soon after this to have the new school called the James M Greenwood High School, in honor of a former superintendent of schools, and a petition was circulated to this effect. But this effort failed and our high school was christened "Northeast High School". 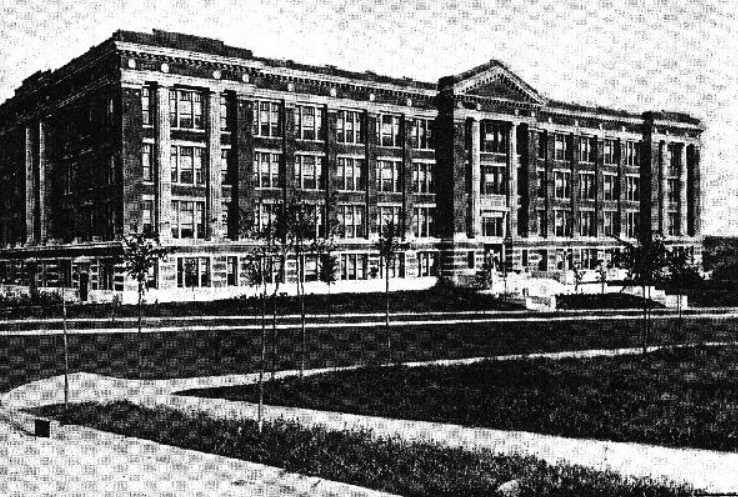 Since Northeast was unfinished when its first term opened, the pupils were forced to attend sessions in the old Central High School building which was located at 11th & Locust. The enrollment was 634. This may be contrasted with the enrollment for this year which is 1740. On October 28, 1913, purple and white were chosen as Northeast's colors and the first yell was composed. One week later "The Nor'easter" was chosen as the name for the school publication. At first it was in the form of a magazine. This year the name of the paper was changed to "The Northeast Courier" in order to distinguish it from the annual. Northeast's first cheer leaders were elected on December 8. Three days later was the High School Night of the Davis-Mills Campaign at the Independence Avenue Methodist Church from which Northeast carried off the prize for the largest attendance. The next day Ernest Swearingen '14, was elected captain of the first basketball team. The Treble Clef was the first club to organize and the Glee Club soon followed. The German Club, Alpha Literary Society, and the Northeast Society of Debate received charters on November 21. On Wednesday, February 4, a charter was given to the Northeast Shakespeare Club. Since then various organizations have grown up until there are nine societies and fifteen clubs. When the Northeast building was opened on April 13, 1913, it created quite a sensation. 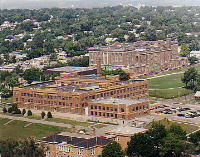 It was the newest and most up-to-date school building in Kansas City, Missouri. Some of the unusual features were a swimming pool and plunge, a lunch room and kitchen, an outside athletic field and running track, an emergency room for teachers and pupils and rest parlors for teachers. Additional features were small cloak rooms, sliding blackboards, eighteen ventilators on the roof which changed the air in the class rooms and a model flat in the domestic science department. This latter was done away with to make room for class rooms as the school grew. Mr. C.B. Reynolds was made principal and Mr. C.H. Nowlin, vice-principal, on March 18, 1913. Mr. Reynolds received most of his education in Illinois, but taught mostly in Missouri. He was principal of different ward schools in this city for sixteen years. His position at Northeast meant a great deal to him and he was honored and loved by all the students until his death in 1926. Mr. Nowlin was a graduate of Kansas University, and was a member of the Central High School faculty for eighteen years. In 1923 he became principal of the Northeast Junior High and A.T. Chapin was promoted to the vice-principal ship. He remained there until 1926 when he became principal of East High School. Miss Nelson was Northeast's first office clerk. Mr. B.M. Stigall was made principal at Mr. Reynolds retirement in 1921-22, and so remained until 1925, when he was transferred to Paseo High Shool in June, 1926. Mr. F.H. Barbee is now filling that position. Of the faculty which first came to Northeast, fourteen still remain; they are: Mr. E.D. Phillips, Miss Eva Packard, Miss Anna Pile, Mr. A.T. Chapin, Mrs. Sabra Cunningham, Mr. James Ellis, Mr. Barry Fulton, Miss Mildred Keating, Miss Martha Rouse, Miss Julia Guyer, Mrs. Louise Harrison, Mr. F.E. Chaffee, and Miss Nellie Stewart. Since her establishment, Northeast has ranked high in athletics; her debates have been intensely interesting; her music almost unexcelled and her R.O.T.C. work has been most commendable. In all interscholastic events she is recognized as a power. For this much credit is due the many instructors who have so ably guided the footsteps of the pupils who have filled her halls. It is thru their undying perseverance that the student body has been inspired with the desire to do their best for their alma mater. Those teachers who have been with Northeast through her younger days are especially to be commended for their inspiration and leadership in building up this powerful institution, in making of a beautiful cold building an equally beautiful living institution. The name of Northeast High School is recognized throughout the colleges and universities as one of the finest high schools of the middle west. Her graduates are distributed all through the United States, many of them occupying the highest positions of the country. Northeast High School has been a power of Kansas City for the past fourteen years, she is a power of the present and from all indications she will continue to be a power through time immortal. They have built up a traditional high standard for Northeast's pupils to follow and to strive to attain. That standard has not been set so high as to discourage anyone, but high enough to call forth the best in all. The building's lighting system was changed from incandescent to floresent lighting in 1967. The ceilings were lowered with acoustical ceiling tile on metal grids in 1968. December 13, 1988 - Open House/Dedication Ceremony when school became Northeast Law and Public Service/Military Magnet High School. Basic curriculum plus career courses from law enforcement and politics. New Courtroom Facilities named after Clarence Kelley '28 & William Steele Sessions '48. Mr. C.B. Reynolds was made Principal and Mr. C.H. Nowlin was Vice-Principal on March 18, 1913. The following are approximate terms of office for the School's Administrators.